The NEW horse Identity system that attaches to your saddle. 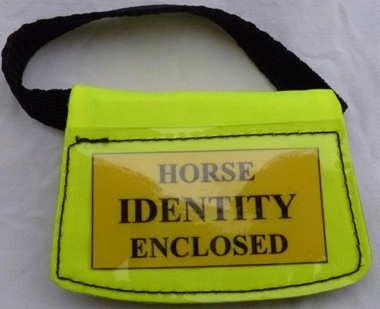 The Locata Horse Identity Tag is a complete system to help the rider to be re united with their horse in the event of any separation. Riders Name and Telephone Number. Owners Details, if different from number 1. Vets Details and Telephone Number. Emergency contact names & phone numbers, friends who can transport the horse back to the stables where it comes from if the rider is injured and unable to do so. The Contact Details and Telephone Number for the stables where the horse is kept. It also tells you of any medical problems the rider and/or the horse may have as well as any medications either may be on, this vital information, which perhaps due to their injuries, the rider may be unable to give to the paramedics or the vet at the time it is needed. It includes the local police telephone number/s and gives guidance to the person who catches the horse. We have covered every eventuality we can think of so the horse and rider will be cared for in any situation. This tag can hold far more information than just a metal dog tag attached to the saddle. Included in the kit is a spare form and a spare plastic pouch should you need it. Many colours to choose from and even a saddle shaped leather version.